After another long hiatus from Flannel Friday (my last contribution was in February! ), I am back with a 5 Little Whats-it rhyme. 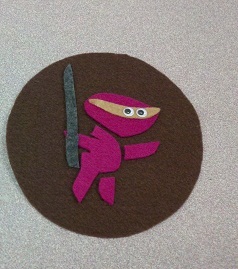 As I was planning my spring Pre-K storytimes, I had an urge to do a ninja themed storytime. 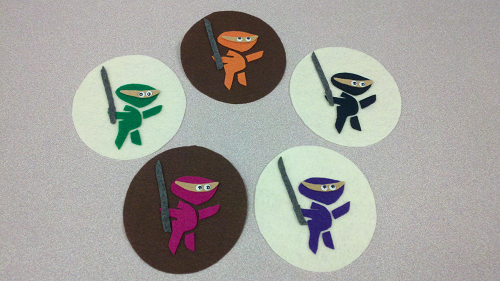 Because — I mean, let’s face it — ninjas are awesome! And some really remarkable ninja books have come out recently that are just meant to be read in storytime! However, finding extension activities for this theme was pretty darn difficult! So I ended up making up my own Five Little Ninjas rhyme and creating this flannel set from some clip art I found in Microsoft Word. One little ninja, on the run. He says HIYAH, and then there were none. Amanda is hosting this week’s Flannel Friday over at Trails and Tales. And don’t forget to check out our Website and Pinterest! I love this! I’m going to order these books right now. So much FUN!! Thanks for sharing. This flannelboard and rhyme just made me giggle uncontrollably while working the circ desk. I absolutely adore it! Thank you!